The Creative Process–what is this elusive affair? How do we catch it? How do we coax it to life when we have a wicked sinus headache and our beds are calling? If you know, please message me. But what, you ask, does this intro. have to do with my title? Gentle reader, it is an excuse, an explanation of why I am posting my 154 word Flash Fiction Friday entry (based on the photo below) instead of wowing you with glib commentary or poignant prose. I do not have enough creative energy to conceive both a post, and the words I would like to lay down today for my NaNo Novel. I’ve already consumed my muse and dare not have a second cup (my Creative Process usually involves a cup of English Breakfast Tea with milk and sugar–my addiction began when I went to UK in my twenties. Thanks Brits and Welsh and Irish folks, my life is better for it!). 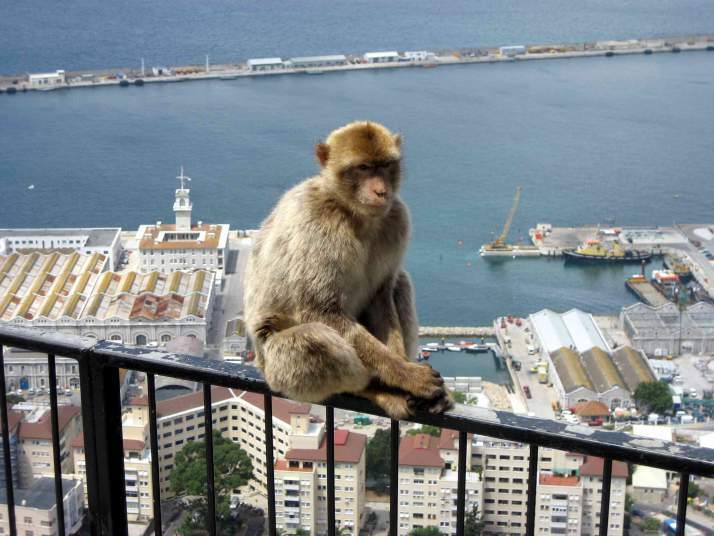 They sometimes call me Barbary Ape, but I’m not, you know—an ape. I’ve got a tail (though its vestigial and not prehensile and the spider monkeys don’t think it counts). But what chaps my hide isn’t being mistaken for an ape, its that we Barbary Macaques don’t get the props we deserve for our domestic side. People ooh and ah over my thick fur or my agility. But do they give me credit for raising babies, even if they don’t happen to be my own? No. In fact, they glance to the side, embarrassed, unsure how to understand that a viral and potent male, such as myself, can also have a nurturing side, one that supports the raising of my group’s young because it’s the right thing to do. So, no, I’m not really going to jump. I just climbed up here to draw a much needed spotlight on the issue. Humans, take note.